A Dongle is a blue USB that automatically activates our software. The dongle makes an internet connection unnecessary and speeds up the process since you do not need to manually enter your code. 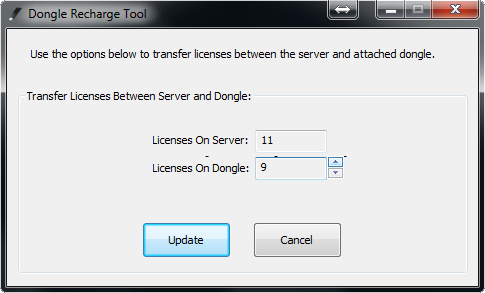 The USB Dongle Recharge Tool can be used to transfer wipes between the Cloud Activation Code and the USB Dongle. This can be useful if you have run out of wipes on your USB Dongle, but have wipes left on your Cloud Activation Code. After downloading and opening the Recharge Tool, you will see the Cloud Account ID screen. Make sure you are connected to the internet, and enter in your Cloud Activation Code. 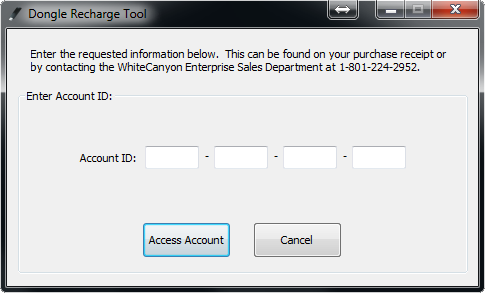 If you're unsure as to what your code is, check your invoice/receipt, or any trial e-mails that were sent by one of our reps. You can also contact WhiteCanyon Enterprise Sales at 1-801-224-2952 to acquire it. After entering in your code, click Access Account, and you will be taken to the Recharge screen which will show you how many wipes are available on both the USB Dongle and the Cloud Account. Re-assign the available wipes between the Cloud Account and the USB Dongle by click the up/down arrows next to the input box. When you are finished, click Update, and your wipes will be ready for you to use through the method that you would like to use them.